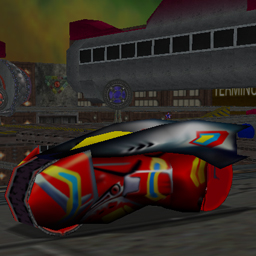 G-Spark is one of the several super bikes available in the N64 game Extreme-G 2. A similar model is present on DEV version of Re-Volt, but very incomplete. This vehicle is a remap/remodel of this incomplete model. There're a couple of additional parameters available: one is to use pickups and other was an attempt to reproduce the controls from Extreme-G 2.